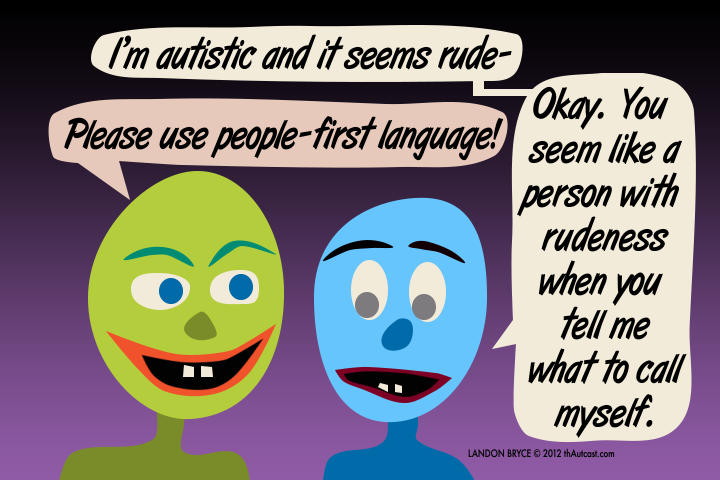 Autism Acceptance Digest: Autistic First, Person Second! Musings from a smiley Autistic. 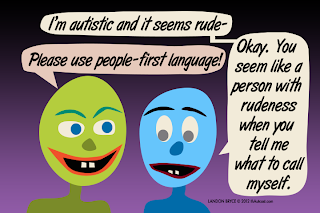 Recently Autistics I know have been talking more and more about "person first" language and how they as Autistics feel about it, whether they consider themselves a "person with Autism" or "an Autistic person", I consider myself to be the latter and prefer that others refer to me as such. I am an Autistic person, my Autism is part of every aspect of who I am and how I see the world. I know that I am different, to be like everyone else would be boring! To further address "person first" language, I would like to introduce you to Jim Sinclair an Autistic self-advocate and organizer of Autreat, a yearly retreat run by Autistics for Autistics. In 1999 Jim wrote a piece about “person first” language. I shall now let that piece speak for itself. I am not a "person with Autism." I am an Autistic person. Why does this distinction matter to me? 1) Saying "person with Autism" suggests that the Autism can be separated from the person. But this is not the case. I can be separated from things that are not part of me, and I am still be the same person. I am usually a "person with a purple shirt," but I could also be a "person with a blue shirt" one day, and a "person with a yellow shirt" the next day, and I would still be the same person, because my clothing is not part of me. But Autism is part of me. Autism is hard-wired into the ways my brain works. I am Autistic because I cannot be separated from how my brain works. 2) Saying "person with Autism" suggests that even if Autism is part of the person, it isn't a very important part. Characteristics that are recognized as central to a person's identity are appropriately stated as adjectives, and may even be used as nouns to describe people: We talk about "male" and "female" people, and even about "men" and "women" and "boys" and "girls," not about "people with maleness" and "people with femaleness." We describe people's cultural and religious identifications in terms such as "Russian" or "Catholic," not as "person with Russianity" or "person with Catholicism." We describe important aspects of people's social roles in terms such as "parent" or "worker," not as "person with offspring" or "person who has a job." We describe important aspects of people's personalities in terms such as "generous" or "outgoing," not as "person with generosity" or "person with extroversion." Yet Autism goes deeper than culture and learned belief systems. It affects how we relate to others and how we find places in society. It even affects how we relate to our own bodies. If I did not have an Autistic brain, the person that I am would not exist. I am Autistic because Autism is an essential feature of me as a person. 3) Saying "person with Autism" suggests that Autism is something bad--so bad that is isn't even consistent with being a person. Nobody objects to using adjectives to refer to characteristics of a person that are considered positive or neutral. We talk about left-handed people, not "people with left-handedness," and about athletic or musical people, not about "people with athleticism" or "people with musicality." We might call someone a "blue-eyed person" or a "person with blue eyes," and nobody objects to either descriptor. It is only when someone has decided that the characteristic being referred to is negative that suddenly people want to separate it from the person. I know that Autism is not a terrible thing, and that it does not make me any less a person. If other people have trouble remembering that Autism doesn't make me any less a person, then that's their problem, not mine. Let them find a way to remind themselves that I'm a person, without trying to define an essential feature of my personhood as something bad. I am Autistic because I accept and value myself the way I am. A generally happy Autistic who wants to make a better world! :) Please remember that Autistic Rights are Human Rights! I am an Autistic person not a person with Autism. Urgent Appeal for Action to Save an Autistic Adult! Autistic Me - My post for the This is Autism Flash Blog. Happy Autism Acceptance Month 2016 to one and all! A Rallying Cry for Justice for Issy! You're a firework...show 'em what you're worth! It's Time to Break the Chains! I Am Not a Token Autistic! Autistic Rights are Civil Rights! I live and breathe Autism Acceptance every day! Be you, the only YOU, you can be! © 2011 Autism Acceptance Digest. Simple theme. Powered by Blogger.